Suzanne of threepeats Jewelry creates necklaces and earrings using recycled vintage beads, chain, ribbon and lace (and new felted wool beads in select pieces). 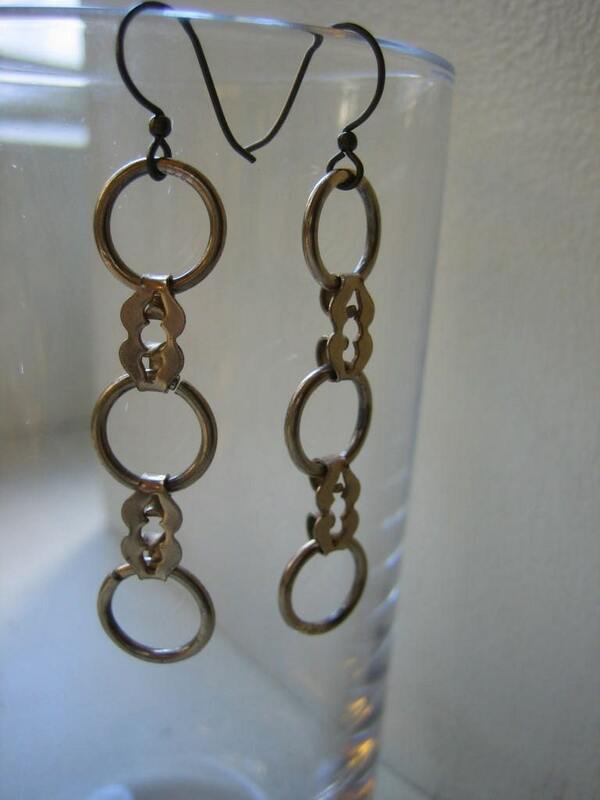 Her designs are long, light, easy to wear, and affordable. Each piece is handmade and unique! Check out her "New for Spring" shop section for her latest line of jewelry incorporating bits of vintage lace and ribbon. Tell me about how you originally got into your craft, Suzanne. I have collected vintage jewelry for a long time. I admired the materials and craftsmanship, and I think it reminded me of pleasant hours spent rooting around my mother's jewelry box. About a year ago, when I realized I didn't wear any of it because it was too heavy or too tacky or too fragile, I decided to start selling it online to people who would wear it and use it. Instead I started fooling around with taking apart some of the pieces and refashioning them into necklaces I would wear. As a dance teacher, I wanted to create a necklace that was long, light, easy to put on and take off and looked good no matter which part of it had slipped around my neck. I came up with the design of a claspless necklace with three sections of beads divided by three sections of chain...three repeated parts or threepeats! I wore the necklace and got compliments. I made necklaces for friends and family and got more compliments and the rest (shall we say) is history. When customers started asking for earrings, I began making them which was an excellent way to use up short sections of leftover chain and leftover beads! Travel! I spent a month in Australia and New Zealand last year...the trip of a lifetime...but there are so many other places I want to see. Promotion. I'm not a natural "salesperson." And just when I think I've learned everything I need to know about social networking, someone invents something new. My Soft Touch Necklace. It was the first time I added felted wool beads and vintage fabric to a necklace. I have to admit that sometimes I decide to keep things I've made to sell for myself! I love the work at Dragon House of Yuen and the work at creative nuts, but there are so many and new ones all the time. I especially admire the artists who recycle unused or unwanted things into their work. More travel (I hope) and more learning! I'd like to learn how to felt wool, crochet, weld metal, blow glass, play the piano and weave...oh and make risotto! Visit threepeats Jewelry at Etsy and threepeats.blogspot.com. Suzanne will also be participating in the Vintage Indie Market (Spring/Summer 2009 Edition) which will run online from May 15th through July 15th. Keep watching her blog for more about this event. Suzanne has graciously offered to give one of my readers one free item from her shop! All you have to do to enter is pop on over to threepeats Jewelry and have a look around, then come back here and leave a comment letting us know which piece from her shop is your favorite. It's that easy! The deadline for entry is noon Central Time on May 15, 2009. Click here for the fine print that goes along with any giveaway on this blog. I will notify the winner via e-mail and announce the outcome on the blog. You must include an e-mail address in your entry if there is not one listed in your linked profile. Failure to include a way to contact you via e-mail will disqualify you from the drawing. Just saying. Obscuring the e-mail address to hide from the bots is just fine (i.e. joe [ at ] email dot com). The prize will be chosen from an item in stock at the time of contact between the gifter (Suzanne) and the winner.